It may sound like an odd move, but when Impact PR & Communications first set up its new office in the Arlington Business District, near Vassar College in Poughkeepsie, a few calls were made and one of them was to a professional organizer. We hadn’t even finalized our coffeemaker selection – thank goodness we have that squared away now – but we knew that having a system in place was key to our success. Our founder, Filomena Fanelli, first encountered Colleen Ashe of Ashe Organizing Solutions at a networking meeting and the two have been fast friends since. 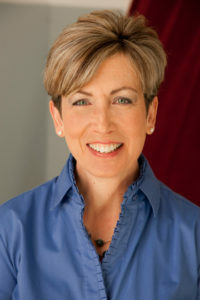 Colleen worked with us to elevate her profile locally (she’s now a media maven and seasoned public speaker); we called her for a number of jobs (Filomena still raves about an art supply closet and home office area Colleen put into place) and now we’ve asked her to be our guest. Back It Up, Please: Have you ever faced the dreaded blue screen of death? (Your computer has died and a scary blue screen is all you’ve got?) Don’t leave it to chance. All your business records and intellectual property are on the line. Take charge and implement a back-up and recovery plan, preferably one that includes an off-site solution. 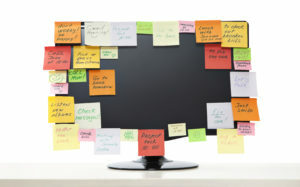 Take Down the Wallpaper: Post-it™ notes lined up on the edge of your computer screen make ugly wallpaper. Take charge of your to dos and reminders and give them a home. 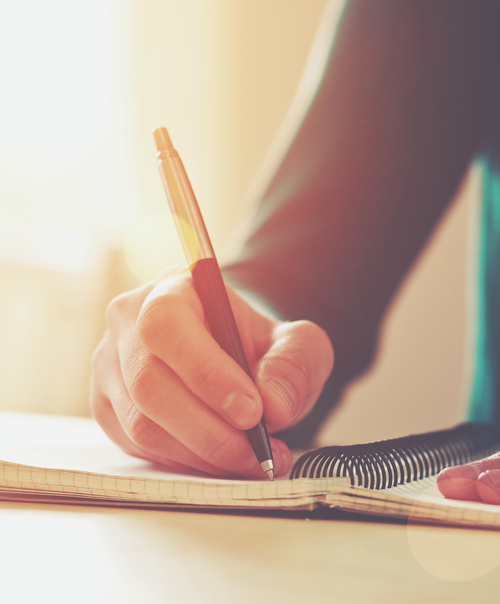 Whether on paper or on-line, have one—and only one—master to do list. Transfer the contents of those Post-it™ notes to your master list and not only will you feel lighter, but your work space will look cleaner! Don’t File It: A whopping 80% of all paper we file, or pile, we never look at again. So, before you file or pile it, ask, “Can I get this information elsewhere, in the future, should I need it?” If the answer is yes, then by all means recycle or shred it! Location, Location, Location: For those papers that you must keep, such as business tax returns, archive them – i.e. remove them from your prime filing space. No need to have “just in case” files taking up your prime real estate. And, for those files your accountant has said can “go,” let ’em go to the recycle or shred bin. Exit Strategy: Before you run out the door at the end of the day, make a conscious effort to stop working 15 minutes early. Use this time to review what’s on deck for tomorrow. Plan your next day so you can hit the ground running when you arrive at the office. And, at the end of the week, take another 15 to 20 minutes to review the week’s accomplishments and make adjustments for the upcoming week. For tasks that absolutely must get done, be sure you have reserved dedicated time on your calendar.